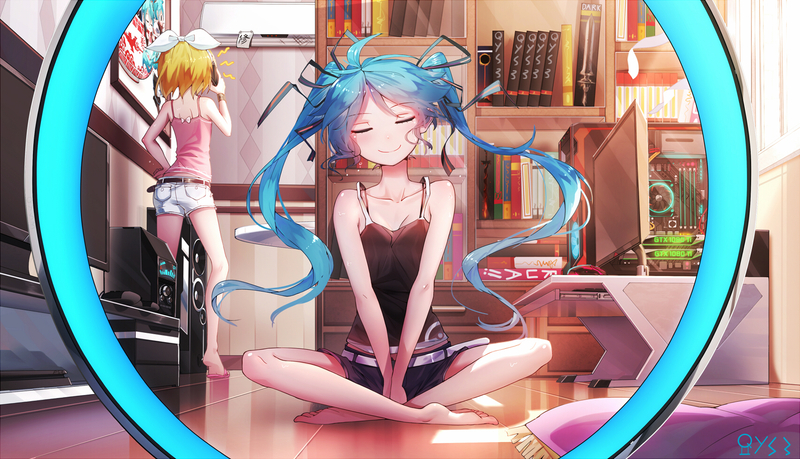 The main male protagonist is at the bottom left (his back turned to you), while the main female protagonist is at the bottom right. Only one screenshot are taken when watching this anime, so please forgive me about the lack of pictures in this blog entry. Just like what I have mentioned in my last review, the next three anime titles that will be reviewed here are 2009 titles. After watching (and reviewing) all three titles, I will then pick one of them to become the first anime that will assume the mantle of being the holder of ‘Anime of the Year 2009’ title, and get listed on the side-bar at the right. The three titles that will become the provisional candidates for the title is the second season of the Wolf and Spice series, the much overhyped K-On and the mahjong anime Saki. I’ll get started with the sequel of the current Anime of the Year 2008 Wolf and Spice, and lets see whether this anime has a better luck than the sequel of Nodame Cantabile, which is not as good as the first one. The two main protagonists continues their journey north, after the events that unfolded at the end of the first season. There are two more story arcs that happened in two different cities, as the main male protagonist helps the main female protagonist returns to her homeland (did not arrive yet). The continuation are done seamlessly, with necessary flashbacks from the scenes happening in the first season being shown sparingly. 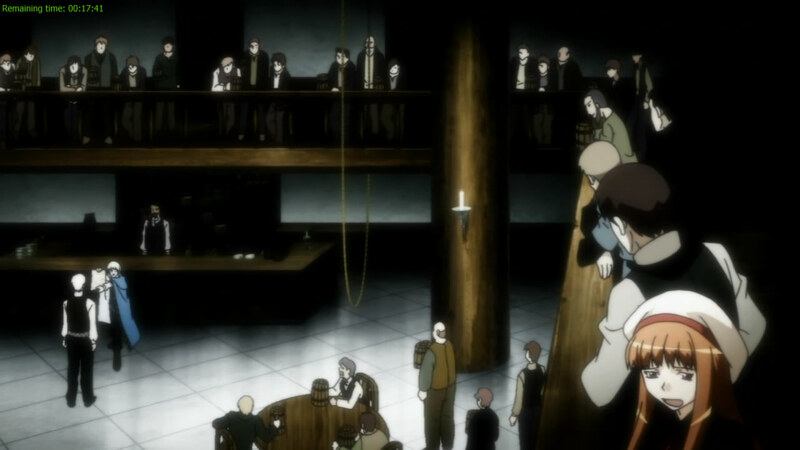 The two story arcs in this second season are similar to what you may seen in the first season. The first arc is solid, it is almost like a mind game instead of your usual merchant trading stories that you can see in the first season. Plus, the first arc also helps advance the main storyline quite a bit. The second arc meanwhile, is a little bit meh, and this will have its own repercussion later on. The plots in each arc flows smoothly with good pacing with the exception of the second story arc, and it will be explained below. The part where the second season really regressed is the ending. Just like the first season’s ending, the one in the second season opens up the possibility of a third season. The problem is, compared to the first season’s ending (which is excellent), the ending in the second season is poorly formed and presented to the audience. This was partly influenced by the poor plots in the second story arc, but more importantly, the last 2 episodes in the anime seems to be rushed. I think this happened because the anime is running out of airtime, and an extra episode may have helped the plots in the second arc develops much more naturally, just like it is in the first arc and the ones in the first season. The lackluster ending was offset by the improved character developments in the second season. If there is one thing the two story arcs this second season has, that would be the excellent character developments that has surpassed the efforts done in the first season. The director builds on the excellent foundation already laid out in the first season and improved it much further in the second season, especially in the first arc. My comment from the first season still applies. My comment from the first season still applies. The voice acting from the two protagonists are excellent in this dialogue-heavy anime. The OP/ED themes in this second season are nowhere as good as the ones in the first season, but the OST has improved markedly. The animation and choreography in the second season is the same as in the first season. The directing has improved, and there are no more DVD-only episode it seems. 10 out of 10, although its position is less tenable than the first installment of this series. Nevertheless, this score should put Wolf and Spice 2 in the pole position for the ‘Anime of the Year 2009’ title. K-On, which will be next in line, and also Saki will have their work cut out for them if they covets that particular title.